Beginning in March of last year, Apple was required to stop selling its Mac Pro computer in Europe because the product was not compliant with some local regulations. Nearly a year after that ban was put in place and Apple stopped taking orders from European customers for the Mac Pro, the device is back on the market thanks to a new version which was not restricted by the regulations. When the ban was put out, Apple was still allowed to get rid of its inventory after March 1 but was unable to take any new orders, however the company stopped the majority of its Mac Pro sales around the middle of February 2013. According to 9to5Mac, European regulators initially imposed the Mac Pro ban because of issues with the fans present in the computer. The exact issues were not substantial but seemed to be a of a technical nature that Apple simply could not bother to deal with in order to kickstart its European sales before the release of the new Mac Pro. Orders for the new Mac Pro have already been taking place inside of Europe and some customers have been sharing screenshots of their orders which show arrival dates as early as January 14. According to the Apple online store, orders that are placed today will not be arriving until February. 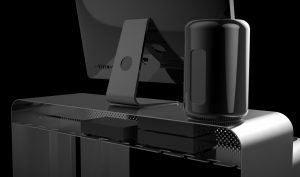 The new Mac Pro is the most significant change from its previous iterations and as a result, it has been well received thus far. Although the so-called “Apple Tax” is still present with some parts of the computer, further analysis has shown that it may actually be a very cost efficient device thanks to the powerful FirePro graphics cards from AMD that are present inside. European regulators have shown no interest in halting sales of the new Mac Pro which means that the computer should be up to the necessary standards unlike its predecessor. Summary: Ever since a sales ban was put in place on March 1 of last year, European customers have been unable to purchase a Mac Pro computer. Thanks to changes present in the new version of the device, people in Europe are finally able to place orders for the Mac Pro once again.